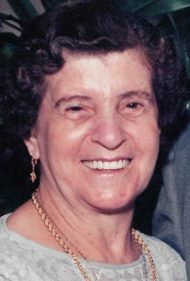 Toula Bournelis, 88, of Lancaster, PA, passed away Friday, January 18, 2019 at Hospice & Community Care, Mount Joy. Born in Kos, Greece, she was the daughter of the late Vaggelis & Vaggelia (Argires) Sambunaris. Toula was the wife to the late Nicholas Bournelis. She worked 20 years in the laundry department at Lancaster General Hospital, retiring in 1993. She enjoyed cooking, sewing, Greek movies and reading her spiritual books. Toula was a faithful member of Annunciation Greek Orthodox Church. Survived by, son, Peter Bournelis, husband of Marcia, their children, Nicholas & Savvas Bournelis, and their children, Sophia & Alexis; son, Evangelos Bournelis; son, Jim Bournelis, husband of Chrysan, their children, Ian & Nikolas Bournelis; son, Leo Bournelis, his children, Alexandria & Kylie Sheesley and Cole Bournelis, and their children, Skylar Shissler and Liam Shaubach; and son, George Bournelis, husband of Diane, their children, Toula & William Bournelis. She was preceded in death by a brother, Nicholas Sambunaris, and a sister, Cocona Tsesmezi. A viewing will be held from 6-8 PM with a Trisagion Service at 7 PM on Monday, January 21st at the Charles F. Snyder, Jr. Funeral Home & Crematory, 3110 Lititz Pike, Lititz, PA 17543. Viewing will continue on Tuesday, January 22nd from 9:30-10:30 AM at Annunciation Greek Orthodox Church, 64 Hershey Ave, Lancaster, PA 17603 with a Funeral Service to begin at 10:30 AM officiated by Rev. Hector Firoglanis and Rev. Alexander Veronis. Toula will be laid to rest at Conestoga Memorial Park. In lieu of flowers, should you so desire, please make a donation to Hospice & Community Care, PO Box 4125, Lancaster, PA 17604-4125. Our Deepest Sympathies on the falling asleep in the Lord of your Mother and Yiayia, Toula of Blessed Memory. May her Memory be Eternal. And may God comfort you all in this time of loss. Zoes O Logos sas. So sorry to hear of the loss of your mother. Please accept our condolences. Hope the memories help heal the pain. You are in our thoughts and prayers. Sorry to hear of your mom’s passing. Our deepest sympathy and prayers go out to you and your families. This Beautiful Woman lives on in the memories of all who knew her, as well as in the hearts of all who heard stories about her. Thank you for the stories, Ian. George, I am truly sorry for the loss of your mom. Condolences to your entire family. May she rest peacefully. So very sorry for your loss. May Toula rest in peace.